I and many others have talked in other OPs this election season about reasons Mormons disagree about this election and how we can see such strong differences of opinion among people who seem to share common values. With election day looming large, I wanted to finish off with one last look at the psychology of voting in 2016 to try to understand what I’m seeing when beloved ward members, friends and colleagues make political statements on their Facebook status that leave me baffled or worse, losing respect for them. Rather than criticizing one another, perhaps it’s better to take a minute to understand what’s behind our differences. 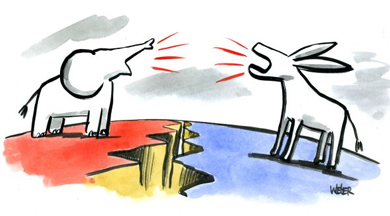 Partisan news and group polarization–reading news stories that demonize the other party is making us stupider, and sharing memes and humorous stories to express our outrage only exacerbates the problem. Prioritization of job duties of POTUS–which aspects of the role we see as most important drive how we evaluate the candidates’ skills and bias our predisposition for one or the other. I recently watched Adam Conover’s Election Special. Aside from some amusing stories about past elections and why this election isn’t as scary or unique as we think it is (although it is both scary and unique), he ended with an interesting segment on how partisan politics are making us stupider. When individuals are given a set of complex but not terribly complicated data, they can work out the obvious conclusions fairly quickly. But when that data is about something like gun control or abortion or gay rights or any other politically charged issue, those individuals are incapable of understanding data that doesn’t support their existing biases. They just ignore what the data actually show and restate their emotionally-held conclusions. Why is this? One reason is that in the internet age, our news is catered to us based on our interests. If I’m on Facebook and I’m presented with an article with the title “Why All Trump Supporters are Brainwashed Idiots” and I open the link, like it, or share it, I’ll be presented with more of the same. If my friend reads, likes, and shares the article titled “Hillary’s Pantsuits Hide Her Demonic Tail and Hooves,” then she will get more of the same. The longer this goes on, the more partisan our news feeds become. And we are consuming a lot of misinformation–in fact, the more partisan the news source, the more likely it is to contain misinformation. And, what’s worse, the more wrong information articles contain, the more popular they are! Buzzfeed did an in depth analysis on ov er 2200 news stories from 9 different sites: 3 from mainstream news outlets, 3 from right-wing news sites and 3 from left-wing news sites. Stories were deemed “Mostly False” if the content in the story was inaccurate. “Mix of True & False” was given if the story was misleading (particularly if the title said something that was not supported by the content of the article) or exaggerated to the point of being untrue. The category “No Factual Content” referred to memes or humorous pieces that were partisan in nature. These posts have a high engagement rate, but they are not factual articles and so were not counted as either accurate or inaccurate, although they were among the most inflammatory in terms of partisan feeling. However, in both the right and left sites, articles that were intended as “fake news” were republished as real news in some instances. Although both left and right pages shared misinformation, the right wing pages had a higher percentage of misinformation–38% of articles were inaccurate vs. 19% of those on the left sites. But come on, that’s either 1 in every 5 story or 2 in 5 that are bad information. We’re no better off than we were when most people got their news from some gossipy frightened relative retelling it to them. Their findings illustrate why those who are digesting strongly partisan news are filling up on misinformation. And the misinformation each side is getting is different from the other side’s misinformation. Our democracy is not really a debate between two sets of ideals but rather a skirmish against a caricatured version of the opposing argument. Pages like [these] play to the biases of their audiences — and to those of Facebook’s News Feed algorithm — by sharing videos, photos, and links that demonize opposing points of view. They write explosive headlines and passages that urge people to click and share in order to show their support, or to express outrage. And in this tense and polarizing presidential election season, they continue to grow and gain influence. And we’ve all seen this play out over and over on Facebook. This is probably not new as papers have often catered to both sensationalism and giving the people what they want; it’s just made easier and faster in our internet age. Within a couple days, Buzzfeed researchers found their news feeds radically altered. Another aspect that I’ve noticed as I read political opinions about candidates that differ from my own is that we prioritize the various job duties of POTUS very differently. Let’s start by looking at a comprehensive list of what the President of the United States does. As Commander in Chief, the president has the authority to send troops into combat, and is the only one who can decide whether to use nuclear weapons. As chief executive, he enforces laws, treaties, and court rulings; develops federal policies; prepares the national budget; and appoints federal officials. How we evaluate each candidate for POTUS depends not only on our assessment of each candidate’s skills and temperament, but on which aspects of the president’s job description matter most to us individually. For example, if you primarily worry about national defense, you may prize military experience, shows of strength, and discipline above diplomacy and judgment in legislative matters. You might care about both, but how much you weigh the relative skills depends on how much you value that aspect of the role the president fills. As I’ve seen Facebook posts from friends and acquaintances that differed from my own, this difference in how we weigh different aspects of the job is often behind our differences of opinion. Some of that is because we just simply associate some of the aspects of the job as always a top priority and sometimes it’s how we interpret what the country needs right now, the current situation. It’s why we say things like “Only Nixon could go to China.” Sometimes we need something specific that a presidential candidate brings to the table. With certain aspects of the role, it’s not just our prioritization or our assessment of the candidate’s skill, but also our interpretation of the lay of the land. For example, when it comes to domestic policy, the policies referred to could run the gamut. We may have completely different perspectives depending on which policy position we are discussing: the environment, law enforcement, funding for schools, how rights are protected, health care, etc., etc. Unfortunately, this year’s presidential debates were light on policy discussion; there wasn’t much time between trading insults and scandals. But the fact is that we each have wildly different opinions about how to prioritize these aspects of the presidential job description, different assessments of the candidates’ skills, and different beliefs about what the country needs right now, based on how we think things are going and what we think will need to be done in the next four years. In my case, as someone who has spent a lot of time traveling or living outside the US, I often prioritize diplomacy and foreign relations in how I assess the candidates, asking “Who will represent us best in the G8 summit?” I wonder “Will taxi drivers in other countries ask me to defend things this person has done or said?” But friends and family members who are more Ameri-centric in their views often focus on domestic issues like supreme court appointments or domestic economic policies. My bias has historically been toward international relations. 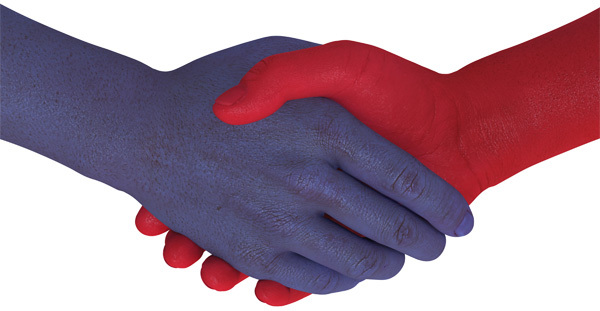 Understanding these differences in opinion may not bring us to the point of agreement, but hopefully, along with a healthy dose of skepticism toward the hyper-partisan messages we are often seeing in our news feeds, we can avoid the divisiveness this campaign has brought out in us. We can recognize that our fellow Americans are acting in good faith, voting their conscience, and seeking the best future they envision. I’m not sure I can pull it off, so maybe I’ll just go to bed until Wednesday. Previous Previous post: Eve Smart, or Deceived? Next Next post: Can the Nation Heal? This is an excellent OP, and I absolutely agree with the pragmatic approach. It is, indeed, easy to be seduced by a candidate’s personality and to forget about the skills needed for the job at hand. Donald Trump seems to be a master at whipping up crowds; Hillary Clinton… not so much. One thing I will say is that I got a certain amount of guilty pleasure out of Donald Trump’s antics… especially as it appeared he had no chance of being President. On the other hand, Trump’s message… like a bad sitcom… got old in a hurry. If he were a TV show, he’d be cancelled after the first season. Clinton’s message, in sharp contrast, is steady and substantive. It’s something I’m willing to watch for the next 8 seasons. Off the subject at bit, my wife took a long road trip and I visited the Nimitz museum in Fredricksberg TX over the weekend. One section of the museum is dedicated to Admiral Nimitiz’s life growing up and as Fleet Admiral of the U.S. Navy in WWII managing millions of people. Walking through the galleries, seeing this man’s accomplishments, and reading his words of wisdom, I was just in awe of his qualities as a leader. 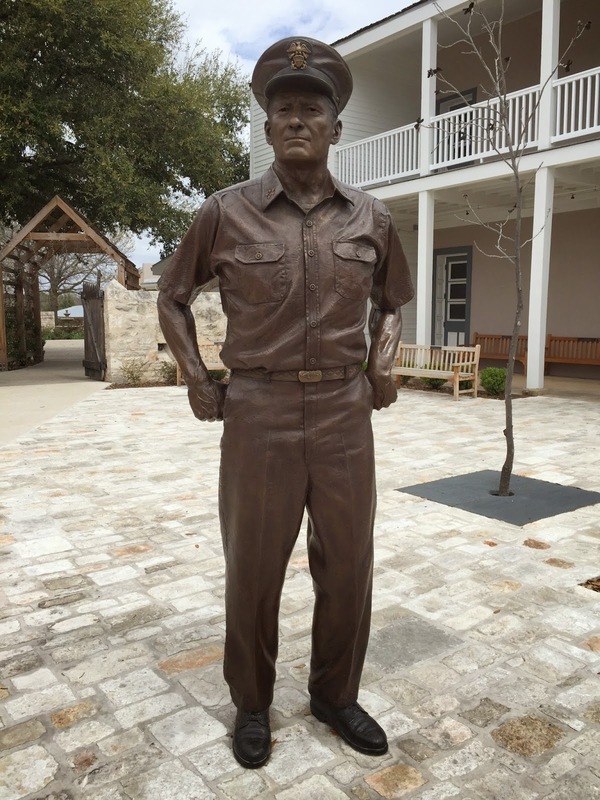 His statue in front of the museum shows a man of intelligence, humor, and personal power joined with true humility. I am inspired by this man even today, and I consider him an archetypal leader. I am not sure either Trump nor Clinton measure up to this man, but I’d say Clinton comes a heck of a lot closer than Trump. Trump ain’t even in the running when it comes to leadership. Please do not sleep through tomorrow if you have not already voted! This country needs more voters like you who can analyze politics like you have demonstrated above. In my state the ballot questions are complex and sometimes misleading if you just read the title. Significant analysis is required for clarity on the issues. The congress and presidential races are runaways here, so local politicians and state ballot issues are the real reason to vote and be counted. I feel like I am up on mainstream and conservative political sites, but I have never heard of any of the left wing sites and only heard of one of the right wing sites you discuss. Maybe I am not as far right politically as I thought. Politico is the one I read regularly of the 9 listed. It is interesting that CNN rates so high (comparatively) in this analysis. After fairly good coverage during the primaries, the pro-Hillary bias is really showing through on CNN recently. It is not necessarily in factual mistakes, but in slanted coverage and opinion. Frank Pellett: Oh, it is. It definitely is. Although since I wrote it here first, the one on BCC is actually a little better with a new article referenced, the NYT piece. Basically, NYT reads Buzzfeed, too. Thus we see the real origin of news in the internet age.